Although Rick’s Picks was itching to short into strength as Wednesday began, we stepped aside when buyers came on stronger than expected. Their bravado didn’t last long, however, and by day’s end bulls looked spent. 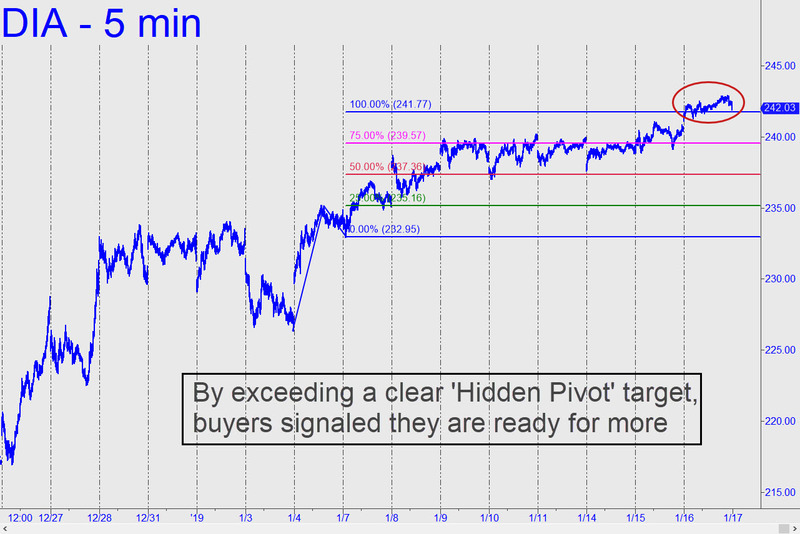 Even so, the intraday highs easily exceeded some short-term rally targets (see chart inset), implying that a moderate pullback from these levels should be regarded as a buying opportunity. In the weeks and months ahead, we’ll need to get used to this kind of herky-jerky price action, which reflects distribution in a bear market. This is a delicate operation, and the smart guys who carry it out must take great care to avoid giving bears even a faint whiff of weakness. This was not a problem when the short squeeze commenced on December 26 with the subtlety of a trebuchet hurling a Chevy Suburban into the sky. Bears dove for cover and have spent the last three weeks cowering. But they’ve grown less intimidated as the rally’s trajectory has flattened, and this is going to pose a problem for those charged with levitating a stock market that may have seen its best days for a long while. They’ll have to make it past Q4 earnings reports — no small feat if the companies fail to deliver. Even so, you should never count DaBoyz out, since these sleazeballs are very good at what they do. Like a great magician, they can make an elephant — or a bear — seem to vanish in front of our eyes, even when we know it’s just a trick. I watch in shock at the 2020 Presidential hopefuls in the Post Parade for the Democratic Nomination. It has become painfully clear that we have become an Idiocracy. Trump won by a nose in 2016, and this time the Democrats will really be stuffing the ballot boxes! Beto, in a true skirmish line patrol, has questioned the need for the 240 year old Constitution! Others want to eliminate the Electoral College, and assign Senators by the States population, with California getting ten or more Senators! Classic skirmish line tactics, send out a patrol to gauge the resistance to the all out assault that is planned. Maxine Waters is already Chair of the House Finance Committee! 1) Stay out of trouble. 2) Make all the money you can. It took 50 years for us to go from Steppenwolf’s “Don’t Step on the Grass Sam” protest ballad to see real change along those lines! And most of us don’t have another 50 years to see if we can roll back the Idiocracy we have become! Counter upward wave 4 slightly over lap counter upward wave 2, this suggest that we have not created an impulse wave lower. This suggest the move from the high point to the 12/26/2018 low point is only low point wave 2. That this downward move is running double the amount of price movement lower, and in 1/2 the time period towards the deepest and fastest 5 Bear Markets in the last 100 years.